Chinese markets fell on Monday, September 8, after the Central Bank cut the mandatory reserves for banks. The Shanghai composite fell, while the Shenzhen composite did the same, on the first trading day since the end of the Golden Week holiday. Hong Kong's Hang Seng index was bearish. Australian markets experienced a partial recovery, but remained bearish as the ASX 200 traded with most sectors on a bearish trend. The People's Bank of China announced that it was considering cutting the reserve requirement ratio, or the amount of cash banks have to hold as reserves, by 100 basis points from October 15. U.S. equities fell on Friday after the release of mixed employment data. Expectations of interest rate hikes are rising. During Monday's Asian trading session, the dollar began with tensions as investors waited to see if China would follow a more relaxed domestic policy. The yuan was expected to fall, increasing pressure on emerging currencies. The first moves were limited, with Japan on holiday and the US bond market paused. The sudden and sharp rise in Treasury yields had underpinned the dollar for much of last week. Oil prices fell during Monday's Asian session after it was said that Washington is considering granting exemptions to its sanctions against Iran's crude oil exports. Saudi Arabia is said to be trying to replace any possible production deficit in Iran. During Monday's Asian trading day gold fell sharply, while the dollar rose after the Central Bank of China relaxed its monetary policy in support of China's economy. On Friday, October 5th, the employment figure came out rather weak and worse than expected. However, looking at it in detail you can see strength points. It has cost a lot for traders to get a proper digestion of the data. There has been an unemployment rate that has fallen more than expected and is the lowest since almost the 1970s. The average year-on-year increase in hourly wages has not surpassed the previous month's growth of 2.9% but has stood at 2.8%, so it is still very high and pushing inflation. On the basis of these figures, the Federal Reserve will continue its upward trend in interest rates much more surely. Was a negative session in the European market on Friday 5 October, which is part of a general weakness, with the focus on the upturn in interest rates in the secondary market, after a good batch of macroeconomic data in the United States. The majority of supersectors are in the negative, with raw materials and technology playing a key role. On the one hand, there has been a great deal of suspicion as a result of information that China has slipped espionage elements into servers and, on the other hand, the mining companies have received a few target price reductions. In general, the drop of more than -1% in the British index has hurt as the pound has strengthened at many crossroads. One or two headlines have been influenced by the fact that an amicable settlement for the exit from the European Union would be close. The American president continues to call for an increase in oil production in order to compensate for the sanctions that will be imposed on Iran. These sanctions will leave out of the market around 2.8 million barrels a day. The feeling that OPEC does not have the capacity to cover this increase, together with the unwillingness to do so, has caused the price of crude oil to soar above 80 dollars a barrel. Two years ago, more than $12 trillion of debt owed by states and companies around the world was quoted on the market at negative rates. Today that figure has been halved. The profitability of the corporate debt index has risen by 40% so far this year. The debt market has ceased to be the Olympus it was in recent years. Macroeconomic tensions and the beginning of the end of financial aid from Central Banks are showing their worst face. The executive director of the Royal Bank of Scotland has said that an exit from the European Union without an agreement with Brussels could plunge the United Kingdom into an economic recession. Next year's growth is expected to be between 1% and 1.5%, but if there is a bad Brexit it could be zero or negative. The big companies are on pause, saying that in six months they will look at the UK again and perhaps come back if the situation is favourable. The British Prime Minister, Theresa May, has indicated that she prefers to leave the bloc without having reached a pact, rather than with a bad agreement for her country. Di Maio's statements put his own interests before those of the country once again. He says that he will always defend the Italians rather than the markets, when he knows perfectly well the high relationship between generating uncertainty in the markets and the deterioration of public accounts. This type of deterioration has a direct impact on citizens. Such statements have been heard before in Greece. It seems that this procedure is constantly being repeated in all countries with populist parties close to power. Chinese markets rebounded on Tuesday 9 October after the falls of the previous session, after the country's central bank cut mandatory reserves for banks. The People's Bank of China has cut by 100 basis points the amount of cash that banks have to hold as reserves. The measure will be effective in October 15. The mandatory reserve ratio is currently 15.5 per cent for large commercial banks and 13.5 per cent for small lenders. The PBOC change came amid concerns about the economic impact of Beijing's ongoing trade war with Washington. Australia's ASX 200 fell as the heavily weighted financial sub-index fell. The major banks were on the downside. The Dow Jones Industrial Average rose for the first time in three days. Its gains remained moderate, as investors continue to be concerned about the prospect of sharp interest rate hikes. During Tuesday's Asian trading session, the U.S. dollar fell against the Japanese yen for the fourth consecutive session. As concerns over U.S. bond yields, the U.S.-China trade war, and the political crisis in Europe continue to weigh heavily. Oil prices rose on Tuesday as more evidence emerges that oil exports from Iran, OPEC's third largest producer, are declining in the run-up to U.S. sanctions. The new hurricane across the Gulf of Mexico may also affect the level of production. During Tuesday's Asian session, gold advanced strongly as investors took refuge in safe havens and at the same time the Asian stock market fell on concerns about a possible slowdown in China's economic growth. Falls on Wall Street after rising tension between China and the United States. Wall Street recorded falls on Monday 8th October, after the Nasdaq fell 3% in the last two sessions. This has led to a sharp rise in volatility on the New York Stock Exchange. The red dominates the world's stock markets, while investors focus their attention on the negative comments of Michael Pompeo, secretary of state, on trade relations with China. Pompeo highlighted the fundamental disagreement with Chinese Foreign Minister Wang Yi during a meeting in Beijing. He highlighted the growing tensions between the world's two largest economies. Wang Yi has pointed out that the United States is interfering in its relations with Taiwan. This has damaged mutual trust and is against the interests of the Chinese and American people. Negative session on Monday 8th October in Europe, where there are still no positive factors. The reading of industrial production in Germany has been much worse than expected, and there are already many more months in negative than in positive so far in 2018. It is something that reaffirms the problems, just when there are a few months left for the quantitative program to end and a cycle of increases begins in the European Central Bank. Speaking of central banks and the euro, in Italy Salvini has once again said that the European Commission and Europe are the real enemies. The first problem, however, came from China. 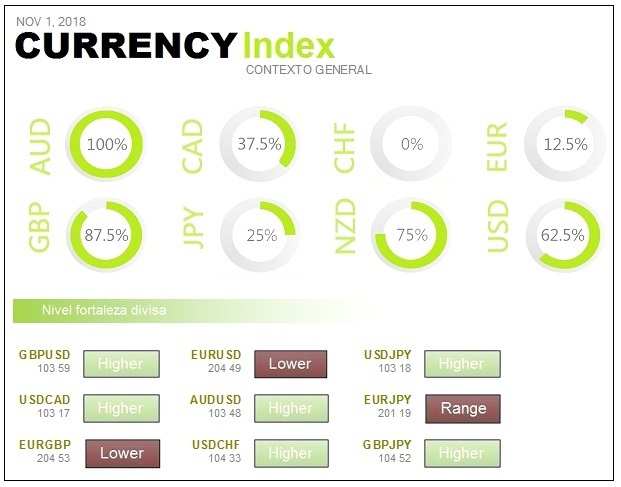 The market has ignored the fact that the indices of purchasing managers, in September, of both services and composite have been better than expected. It has only looked at the collapse, at a negative interpretation of the Central Bank of China's movement, which has consisted of a further reduction in capital reserve requirements. This move is usually made to support the economy. Traders continue to talk about the rally in US bond yields. The ten-year bond closed last Friday at 3.23%, its highest since 2011, after rebounding 17 basis points during the week. The September employment report showed containment in the rise in wages and a further fall in the unemployment rate to 3.7% which is the lowest for 49 years. There is money coming into the safest debt and there is debt coming out of the periphery. Investors are worried about the increasing confrontation between European partners and Italy. In the United States the main concern is the evolution of interest rates. Also see if there is a possibility of an acceleration of the path already traced. The Shanghai index opened the week dropping -3.7%. Other Chinese indices have fallen almost 5%. They are doing so despite the government's announcement of an income tax cut. This is a necessary measure in an environment of economic cooling, debt uncertainty and the consequences of the trade war. The aim is to increase confidence and disposable income aimed at encouraging consumption. It has launched the biggest tax reform in 38 years. New problems now arise as, late last week, details of Chinese industrial espionage were released to U.S. technology companies. They arrive through tiny chips, which they introduce into the systems they sell, with which they would have managed to extract sensitive information from at least thirty giants such as Apple, Amazon or Micron. The problems between the Italian government and the rest of the eurozone countries are increasing. The cause lies in the Italian government's aim to raise the public deficit above that committed to Brussels. The Italian Ftse MIB index leads the sales among the big European markets. Asian markets were mixed on Wednesday, October 10. In Japan, the Nikkei 225 lost some of its previous gains, but maintained its bullish trend. Australia's ASX 200 moved unchanged, with most sectors in positive territory. In China, Hong Kong's Hang Seng index rose while on the mainland the Shanghai composite was bearish. South Korean Kospi fell into negative territory. The president of the United States said on Tuesday that he does not like the Federal Reserve's decision to continue raising interest rates. The U.S. Central Bank last raised its interest rate by a quarter of a point in September, while improving its economic growth expectations for this year and next. Mortgage interest rates are above 5% in the United States, indicating further cuts in house prices are on the horizon. Buyers were accustomed to cheap credit and rising mortgage interest rates are going to make home sales suffer. On Wednesday's Asian trading day, the U.S. dollar has suffered. It does so after U.S. Treasury yields peaked and while the pound was bullish on the possibility that Britain and the European Union would come close to an agreement in the Brexit negotiations. 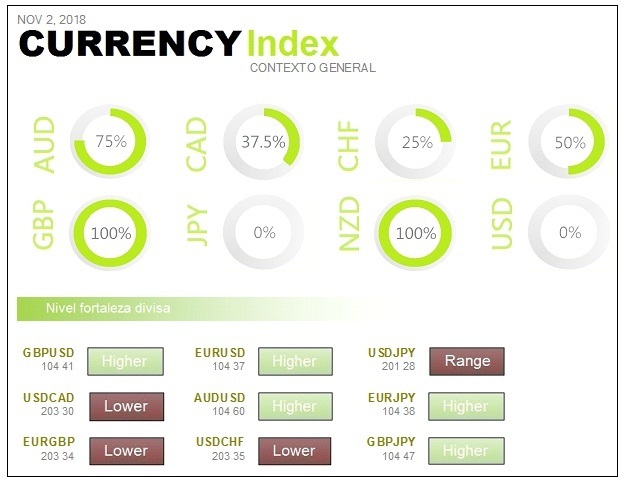 The dollar rally was halted by uncertainty over a number of issues, including the intensification of the China-U.S. trade dispute and Italy's budget plans. Oil prices fell on Wednesday, after the International Monetary Fund lowered its global growth prospects. However, prices were backed up by Hurricane Michael in Florida, which caused the closure of almost 40 percent of crude oil production in the Gulf of Mexico in the United States. Gold rose sharply on Wednesday in Asia, as U.S. Treasury bill yields peaked several years ago, putting pressure on the U.S. dollar. The opening of Wall Street was bearish on Tuesday, October 9. Some recommendation improvements on important stocks within the technology sector managed to turn the Nasdaq around, pulling all other stocks and making the future of the S&P 500 manage to stay on the upside. There have been comments from the International Monetary Fund that it reduced global growth prospects for 2019. The IMF clearly says that the United States is going to be the most damaged by the implementation of tariffs to which the trade rule takes. Was a bullish session in the European market on Tuesday 9 October, on a day that had two clearly sides. On the one hand, declines due to new concerns about Italy's debt market. On the other hand, a technological recovery was done. Everything was devalued as it was observed that in the secondary debt market sales in Italy were raising interest rates again, also putting pressure on Spain. As a result, the banking sector was again in trouble and Italian banks led the declines. UBS issued a note trying to explain the reasons for Wall Street's lack of strength in the last three weeks. Of course the bad influence of weak Europe has been there, but the shots may go the other way. A decisive factor was the decline in buybacks, and in dividend payments, as many companies entered a blackout period as the earnings season approaches. An increase of more than three times in buybacks and dividends is anticipated in the next six weeks. Buybacks are everything in this market. They represent more than $70 billion per month on average so far this year. The ravages that economies may suffer, due to an increase in debt, close to interest rate increases on the part of the European Central Bank, may make history. In perspective there are new interest rate hikes, placing it at ten years above 3.25%, which means a maximum of eleven years. In addition, a German economic institute has put figures to the damages of a hard Brexit. An increase in costs, due to tariffs, would lead to a drop of more than 50% in German exports to the United Kingdom. The weakness of the Euro in all crossings is not being well seen. In addition, there are problems with the debt of the periphery. All these factors are associated with a lack of confidence. He says the government will do whatever it takes to calm the markets if the risk premium goes off. It is committed to the risk premium reflecting the fundamentals of the economy. However, if it rises to 500 basis points, the government will do what it needs to do. It says that if everyone sells, there will be a capital flight. Italy's situation is very vulnerable. If the yield on the Italian bond is already almost 3.7% what could be if the European Central Bank stop buying. German exports amounted to 105,200 million euros last August. This figure represents a year-on-year increase of 2.2%, but a decrease of 0.1% compared to the previous month. Thus accumulates two consecutive falls. Imports reached 88.1 billion euros in August. It is 2.7% less than in July, but 6.2% more than in the same month in 2017. In summary, Germany's trade surplus experienced an increase in August to 17,200 million euros, compared to 16,500 million the previous month. Asian markets fell sharply on Thursday, October 11, while the stock indices of Shanghai, Shenzhen and Tokyo lost more than 4 percent. The ASX 200 fell, with most sectors trading lower. Australia's major banks suffered losses. Both the Dow and the S&P 500 recorded their biggest single-day falls since early February, while the Nasdaq had its biggest single-day decline since June 24, 2016. At the same time, the CBOE volatility index, known as VIX, jumped about 44 percent to 22.96. It is its highest level since early April. Hurricane Michael is predicted to be the most destructive hurricane to hit Florida in a century. It made landfall off the coast of Florida on Wednesday and is now approaching southeast Alabama and southwest Georgia, with winds of 125 miles per hour. During Thursday's Asian trading session, the dollar remained weak against most currencies, with investors seeking safe haven currencies. Crude oil prices fell sharply, as the global stock market suffered a dramatic decline. It was also affected by the release of higher-than-expected U.S. oil inventories. On Thursday the price of gold fell, due to the strength of U.S. economic data. The decline came despite Wall Street's worst decline in eight months. European markets are expected to open Thursday's trading session lower. Nasdaq continues to lead Wall Street losses and volatility soars. Losses are rising, on Wednesday October 10, on Wall Street as the market continues to watch closely as US government bond yields rise. The Nasdaq technology index is down 1.5% and is once again the most bearish, while the Dow Jones and the S&P 500 are also down. The Nasdaq is the index that is suffering the most from the short-term correction on the New York Stock Exchange. It has lost close to 5% in the last five sessions, hampered by the behaviour of the big stocks that had previously led the rises: Amazon, Apple, Netflix, Alphabet or Tesla. In this scenario, the VIX volatility index rebounded strongly by 12% to 18 points and accumulated a 54% rise in the last five sessions. Was a considerable collapse, on Wednesday October 10, of some indices and futures on indices, especially in Germany. There are a lot of problems: Rising interest rates, the impact of the trade war and nothing but getting out of risky assets. Since profits have been concentrated in the technology sector, it is precisely technology that is receiving the most sales. In France, industrial production has slowed down but is still better than expected. In Italy, second month with negative results, although the fall in August was less than expected. In the United Kingdom the gross domestic product for the month of August is absolutely flat. With regard to Italy, it is one of the few things that had improved, with the future of the ten-year debt rising 44 points and with a twelve-month auction that has almost doubled profitability, to almost 1%. Yields are linked to the inflation outlook. Everyone is watching what the Fed does, in case of signs of higher than expected interest rates. Trump has once again exposed where its weakness lies. Once again he has intervened to complain about the Federal Reserve's monetary policy. He believes that the expected pace of interest rate hikes will end up damaging the economy. It is OPEC that holds the economic development of the United States in its hands. There is a possibility that they will not heed America's request to increase production in order to curb price escalation. In any case, the evolution of interest rates will be in their hands. This rise is the main factor cited by traders to explain the Wall Street correction. The ten-year bond yield marked a new seven-year high. The market continues to discount the words of Federal Reserve Chairman Jerome Powell. He commented that the Central Bank is a long way from reaching interest rate neutrality. Interest rates are still accommodative, but are gradually rising to a level where they will be neutral. Crude prices are flat, with an eye on the hurricane that is threatening the southern United States. A potential risk on the oil supply is being created. The imminent passage of hurricane Michael, through the south of the country, has caused a decrease in production capacity of about 320,000 barrels a day. UK Secretary of State for Financial Services John Glen has said London could lose some 5,000 workers when Brexit comes into force. Glen said Britain's exit from the European Union has plunged the financial sector into uncertainty. The aim, with regard to the City, is to ensure that there is as much continuity as possible with regard to the economic value that is capable of generating a sector that accounts for more than £70 billion in taxes per year. Asian equities fell on Monday, October 15, as investors remained cautious after the previous week's global losses. In the China region, Hong Kong's Hang Seng index, Shanghai composite and Shenzhen composite lost their previous gains. Movements in China occurred when new reserve requirements for lending companies came into effect, in a move by the People's Bank of China that is expected to inject 750 billion yuan into the banking system. In Japan the Nikkei 225 fell, with a downward trend in most sectors. South Korea's Kospi also suffered losses, with the heavyweight Samsung Electronics showing a bearish trend. In Australia, the ASX 200 index fell, as most sectors continued to trade lower. The heavily weighted financial sub-index had a lot of negative weight. Last Friday, the U.S. stock market rose strongly, but still recorded strong weekly losses. Investors continue to be concerned about rising interest rates, technology company valuations and a possible economic slowdown. During Monday's Asian trading session, the dollar gained against the British pound and the euro. Meanwhile, British efforts to secure a good deal for Brexit ahead of the European Union summit kept investors' preference for safe haven currencies alive. Oil futures rose sharply on Monday, as geopolitical tensions over the disappearance of a prominent Saudi journalist fueled supply concerns. Crude oil markets also benefited from data showing that South Korea did not import oil from Iran in September, for the first time in six years. This happens shortly before U.S. sanctions against the Middle Eastern country take effect. During Monday's Asian trading, gold advanced strongly, while the Asian stock market was affected by fears of a possible downturn in China's economic growth, in the midst of a trade war, and signs of a tighter monetary policy by the Federal Reserve. Dow picks up but still loses four percent in the week. Stocks rose on Friday, October 12, but still recorded heavy losses during the week. Investors remain concerned about rising interest rates, technology valuations and a possible slowdown in the economy. The Dow Jones Industrial Average had rose, led by Visa. The S&P 500 rose, breaking a six-day losing streak. The Nasdaq Composite performed well, rising more than two percent. Was a downward session in Europe on Friday, October 12, where some positive Chinese data has failed to compensate for the rebound attempt after the losses of previous trading sessions. China's trade balance data, with a further increase in exports and imports, has helped to give some more optimism about the strength of its economy. However, the rebound has not managed to survive the new political fears, which are reflected in the secondary debt market. Industrial production in the euro zone has improved, but the reading of inflation in Germany in September has accelerated a little more than expected. This is good for the euro, but it also strengthens the possibility that the European Central Bank will have the obligation to attend German demands to end the accommodative policy as soon as possible. There have been decreases in German debt futures, there were also increases in Italy's debt. But Spain's debt was the worst of all and this country is now a new focus of concern in Europe. The G2O urged the United States and China to settle their trade differences directly, as persistent tensions are affecting market confidence. International trade is an important engine of growth and tensions that are negatively affecting market confidence and increasing financial volatility need to be resolved. Persistent differences should be resolved by the countries directly involved. The International Monetary Fund asks not to fall into the collective amnesia of past mistakes with protectionist policies. The IMF has called on world leaders to avoid falling into collective amnesia in the face of the well-known negative effects of protectionism. Meanwhile, the World Bank urgently needs to address pressing medium-term issues, such as climate change. The Fund's managing director has doubts that the global economy is strong enough to address the current escalation of trade tensions between the United States and China. For Lagarde, the combination of uncertainty over the framework for regulating international trade and the rise in the cost of financing in emerging markets, due to the normalisation of monetary policy in the United States, implies risks that are unprecedented. There is, however, optimism because growth continues and will do so at a healthy pace, with an estimated rate of 3.7% for the global economy in 2018 and 2019. In the monthly readings of import prices there is a slight increase in pressure on inflation. In the year-on-year readings, however, there is a slight decline. What did not like is that the preliminary reading of consumer confidence from the University of Michigan in October was down on the previous month's reading and came out worse than expected. But in Europe Spain's debt has been the worst of all. On the one hand, the next fear of the market is none other than the presentation of Spain's 2019 general budget to Brussels and the possibility that it could be directly suspended. On the other hand, higher interest rates on the secondary debt market mean that the primary market could also raise them. This means that the private debt of the companies should raise interest rates in the next refinancing, damaging the most indebted sectors. At present, there are fears that there will be new regulations affecting electricity prices in Spain. As a result, all Spanish utilities have had problems. If we talk about indebtedness and secondary problems in the economy, electricity companies, construction companies and banks are being the most damaged. Asian equities were mixed on Tuesday, October 16, as Wall Street fell amid geopolitical tensions between Saudi Arabia and the international community. China's markets lost their previous gains, falling into negative territory at the end of the session. China's inflation in September was up 2.5 percent compared to last year. In Japan, the Nikkei 225 advanced. South Korean Kospi traded without major changes. The ASX 200 traded on positive territory, with most sectors on an upward trend. The heavily weighted financial sub-index also recorded gains. Retail sales in the US rose 0.1 percent last month and is a slower than expected rise. This report shows a modest rebound in consumer prices in the United States. During Tuesday's Asian trading session, the U.S. dollar was on the defensive following the release of disappointing economic data. The Japanese yen and Swiss franc benefited from tensions between the West and Saudi Arabia, as well as the Brexit talks. The dollar struggled, despite weak equities and risk sentiment. This is because U.S. data suggests that consumers are reluctant to spend, and that yields on Treasury bonds stopped after recent price spikes. The controversy surrounding the disappearance of Saudi journalist Jamal Khashoggi remained in the spotlight. Markets are concerned about the possible impact it could have on oil prices. Khashoggi, a prominent critic of the Saudi administration, was last seen entering the Saudi consulate in Istanbul. King Salman of Saudi Arabia has ordered an internal investigation, in collaboration with a Turkish team, to clarify his disappearance amid international protest. Oil prices rose during Tuesday's Asian session because of the fall in Iranian oil exports prior to sanctions, and while geopolitical tensions continue. During Tuesday's Asian trading session, gold advanced strongly. It reached a two-and-a-half month high as investors sought refuge in safe haven securities. European markets are expected to open mixed on Tuesday. One point of concern is raw materials, because the Dollar is falling. All of them are supported and precious metals are rising again. We must remember that gold is a refuge in dangerous times and is having a lot of demand, which goes against risk. On Monday, October 15, the retail sales data for the month of September in the United States was released. There has been a major disappointment, because it repeats the figure of the previous month, falling far short of expectations. The question is that if now, with the impact of the tax cut, retail sales are not going well what can happen when it is diluted. To try to compensate for this, the New York Fed's manufacturing report is better than expected and with some medium-term indicators also improving. Was a bullish session in Europe on Monday 15 October, starting the week supported by an upgrade of Portugal's debt rating. Investors will be watching political developments, ranging from the UK's exit negotiations from the European Union, where no agreement has yet been reached but it looks like it will be because both sides want it, to Germany's political instability. In Germany, Angela Merkel's coalition partners in Bavaria have achieved very bad results and threaten to seek stability at the national level, but are looking for solutions to better explain their message to citizens at the local level. Everyone has Spain and Italy in mind as the focus of problems due to possible rejection of budgets dominated by increased spending and deficits. This is just the opposite Brussels wants to ensure economic stability. The Russell has taken advantage of the improved tax cuts and the trade war. However, capital is coming out of where it is supposed to be the most benefited point of the current situation. And now there is a cycle of rising rates. Looking at the European market inside, most supersectors are in negative with the industrial being the worst of all. A negative comment on the consequences of the UK's uncontrolled exit from the European Union, made by Germany's association of chambers of commerce, is carrying a lot of weight. May is waiting for the adoption of proposals, by Members of Parliament, to make a statement. She believes that real progress has been made in the exit talks, but there are still a number of unresolved issues about Ireland. It hopes to reach agreement because both sides have made it clear that there is a desire to reach an understanding. We are now entering the final stages of negotiations and it is time to calm down and think coldly. It is time to focus scrupulously on the few remaining critical points. Real progress has been made, both on the exit agreement and on the future relationship between the two sides. There is no new news about the trade war, but another tension has been added between the United States and Saudi Arabia. The new problems could cause the price of crude oil to continue to rise. On the Arab side, they try to reassure the market by saying that they will always be there to compensate for the scares in the market. In Europe everyone is very much aware of the days before the Italian and Spanish budgets are sent to Brussels. Nobody yet knows what might happen, but investors have their minds set on Spain and Italy as the focus of problems. The possibility is in the air that budgets plagued with increases in spending and deficits will be rejected. These guidelines are just the opposite of what Brussels wants to ensure economic stability. It has been disappointing that the figure for the previous month has been repeated and that they are far from what was expected. If, in a situation that benefits from tax cuts, retail sales are not just rising, you have to think about what might happen when the effect of the tax cut is finished. The dollar is having problems, as a negative effect of weak retail sales. It is also due to a weakness coming from Japan, despite the fact that this country has given better than expected industrial production figures. Actually most raw materials are improving. On Wednesday, October 17, Asian equities rose after a strong rally on Wall Street. In Japan, the Nikkei 225 rose, with most sectors on an upward trend. In South Korea, the Kospi was bullish. The ASX 200 rose, with most sectors in positive territory. Mainland Chinese markets were mixed. The three main Wall Street indices rose by more than two percent each, as the business results of the main companies generated strong earnings. This indicates that the U.S. economic recovery is on track, despite the impact of rising interest rates and global trade war tensions. Tuesday's data showed that U.S. industrial production increased for the fourth consecutive month in September. It was driven by gains in manufacturing and mining production. However, the momentum slowed sharply throughout the third quarter. President Trump continued his criticism of the Federal Reserve. He describes it as his biggest threat as, according to him, they intend to raise interest rates too fast. 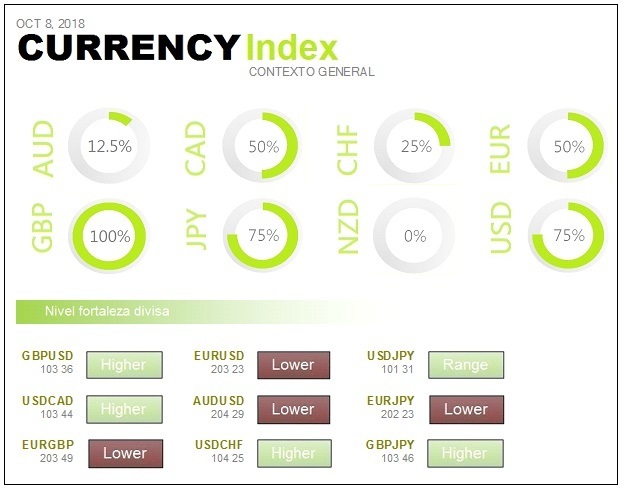 During the early part of Wednesday's Asian trading session, the dollar gained against the Japanese yen, as Wall Street optimism caused global sentiment to move away from safe-haven assets. Oil prices rose sharply in Asia on Wednesday, after a surprise drop in U.S. oil reserves. Gold remained stable on Wednesday, despite a rise in equities. Investors are waiting for the release of the minutes of the last Federal Reserve meeting to get new insights into the pace of interest rate hikes. Nasdaq goes up and Wall Street scares off the bassists with a big bounce. Wall Street recorded strong gains on Tuesday, October 16. Dow Jones, S&P 500 and Nasdaq have risen. Morgan Stanley and Goldman Sachs helped, outperforming consensus expectations with their third quarter results. The New York Stock Exchange is recovering in part from Monday's and last week's losses. This fastor is pushing away bearish investors for the moment. Bank of America has shown, in a survey of investment funds, that there is a great deal of concern about the slowdown in global growth. The cause is none other than the U.S.-China trade war. Was a bullish session in Europe on Tuesday 16 October. All supersectors show a clear rebound after the recent downturns. Technology has been on the upside and the improvement in the confidence of builders in the United States has managed to alleviate the fear of rate hikes. The budgets of the most worrying countries in the euro zone have already been sent to Brussels. Now investors are waiting to see if there is acceptance or criticism from the EC. Problems with Spain or Italy, but it is worth remembering that Greece is in a similar situation, although it does not carry as much weight in the gross domestic product as the first two countries as a whole. The economic sentiment of Germany, in October, of the ZEW Institute has been known. There has been a major collapse and many months are already in negative. The President of the European Council, Donald Tusk, has assured that he will ask British Prime Minister Theresa May for new proposals. The Brexit negotiations are currently stuck over the question of the Irish border. Some new, really creative proposal is needed to protect Europe's values, and to protect a single market, while respecting UK sovereignty. Both the European Union and the United Kingdom want to prevent the return of a classic border between the British province of Northern Ireland and the Republic of Ireland. The aim is not to weaken the 1998 peace agreement. However, for the time being both sides are unable to reach an agreed method on how to do this. In the absence of a better solution, Brussels advocates keeping Northern Ireland in the customs union and the European single market. This proposal, known as the 'safety net', is now rejected by London, even though it was in the December interim agreement. The British government argues that it would compromise the territorial integrity of the UK and proposes a temporary customs arrangement, until a permanent solution is reached. The President of the European Commission, Jean-Claude Juncker, has stated that if Brussels accepts the preliminary budget, presented by Italy, the rest of Europe would rebel. Despite this, Juncker has stated that the Commission will listen to Italian arguments during the period of discussions of his proposal. The President of the Commission asked the other Member States not to put Italy in the dock during the European Union summit that begins on Wednesday. Italian deputy prime minister Matteo Salvini defended his proposal against criticism, and assured that there is no plan 'B' because Italy is convinced that the proposed measures will create jobs and wealth. Oxford Economics experts comment that the rise in volatility in recent sessions, together with the fall in the stock markets, is something normal that has returned to the markets after an exceptional 2017. Remember that the average correction of 6%, recorded by Wall Street in recent weeks, is impressive, but must be placed in a context of previous rises of 8 percent. It seems that the market is discounting that the impressive growth in the US is causing a more aggressive stance on the part of the Federal Reserve. This has led to a big rise in US bond yields. In any case, they maintain their forecast that the central bank will raise interest in December and do so for three times as long next year. On Thursday, October 18, Asian indices fell, following a Federal Reserve report pointing to further interest rate hikes. China's markets were in negative territory at the end of the session. In Japan, the Nikkei 225 was bearish. Japan's exports fell in September, for the first time since 2016, as shipments to the U.S. and China declined. This adds to concerns about the growing impact of the trade war between China and the United States. The ASX 200 experienced a recovery. The financial sub-index returned to positive territory and employment data in Australia, for the month of September, did not meet expectations. The three main stock market indices in the United States ended the day downwards. The Wall Street moves followed the release of the minutes of the September Federal Reserve meeting, which showed the central bank's commitment to a tighter monetary policy to maintain economic stability. The U.S. Treasury Department has said it finds no reason to consider any of its trading partners as intentional manipulators of its currencies. However, it keeps China under surveillance along with Germany, Japan, Switzerland, Korea and India. 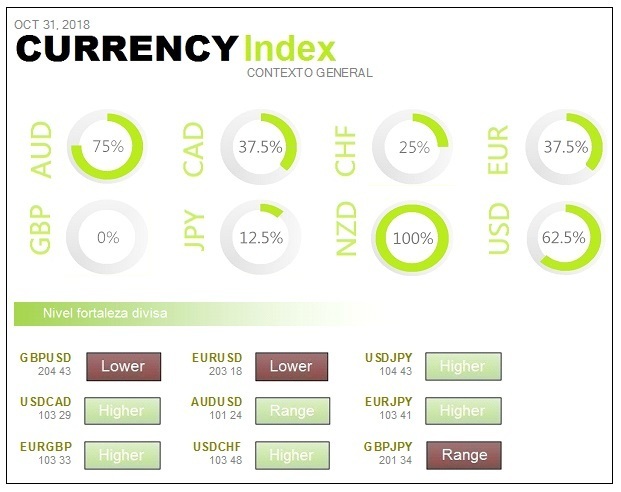 The U.S. dollar have rose against most of its major currency pairs on Thursday after the Federal Reserve reported that it will continue to raise interest rates. All members supported the interest rate hike last month. It was also stated that borrowing costs would rise further. Oil rose during Thursday's Asian session amid continued tensions over the death of a prominent Saudi journalist. Prices stabilized after a sharp drop due to an increase in US crude oil reserves. During Thursday's Asian trading, gold remained stable in a narrow range, as Asian equities fell and the dollar rose after Federal Reserve minutes. Dow falls in a volatile session after Federal Reserve expects more rate rises. On Wednesday, October 17, the Dow Jones Industrial Average fell sharply, after the minutes of the last Federal Reserve meeting showed that its members think monetary policy needs to be tightened to maintain economic stability. The risk of overheating inflation is currently small, but the Fed says that, if inflation rises above its expectations, then rates would rise above the 3% rate that is the current target. IBM's results have not pleased. Moreover, the sharp decline in building permits reminds us of the danger of rising interest rates. The trade war has once again come to the fore, as the U.S. Secretary of Commerce complains that negotiations need to move faster. The United States does not want to be negotiating for years. Negative session in Europe on Wednesday 17 October, with the automotive sector and spare parts being the worst of the day. There in a notable decrease in the registrations of new cars, due to the new regulations of polluting gases. As a result, Goldman Sachs has lowered the sector's outlook for the third quarter, so the German index has a real problem because this heavily weighted sector suffers a significant decline. The problems are also in the health care sector, with Fresenius being the worst in the German index. Problem in Europe remains entirely political. There is uncertainty about the UK's exit from the European Union and the Brussels verdict with the budgets of populist governments such as Spain and Italy. A comment, later denied, was made by a European commissioner to the effect that Brussels was going to push back the Italian budgets. The annual inflation rate rose to 2.1% in the euro area and remained at 2.2% throughout the EU in September. The September figure represents a rise in comparison with the 2% recorded the previous month in the 19 countries sharing the euro. Although the trend did not vary from month to month in the entire EU block. By country the lowest inflation rates were recorded in Denmark (0.5%), Greece (1.1%) and Ireland (1.2%). The highest were in Eastern European countries such as Romania (4.7%), Hungary (3.7%) and Bulgaria (3.6%). Overall, compared with the previous month, the annual inflation rate fell in nine Member States, remained stable in four and increased by fourteen. This country is confident of achieving its growth targets this year. They expect the economy to grow within a reasonable range in the third quarter and will take steps to prevent instability in growth. However, they recognise that they face increasing risks. Above all, caused by the trade war. Uncertainty about the UK's exit from the European Union, which is increasingly likely to be a tough divorce. Doubts about the Brussels verdict on the budgets of populist governments, such as Spain and Italy. Beginning of a new season of business results. It has had a really important collapse. The cause is the new regulation, by polluting gases, on diesel engines. The consequence seems to be that Goldman Sachs has lowered the sector's outlook for the third quarter. The German index has a big problem and right now the automotive supersector and spare parts is the worst of the day, with serious declines. Asian equities were mixed on Friday, October 19, after China's GDP growth for the third quarter of 2018 was below expectations. After a turbulent start, Chinese markets recovered strongly after a series of measures taken by the regulator to support the difficult stock market. China published its GDP figures for the third quarter of 2018, which showed a slowdown in economic growth of 6.5 percent year-on-year. This is the weakest pace since the first quarter of 2009. In Japan, both Nikkei 225 and Topix have declined. In South Korea, Kospi was trading lower. The ASX 200 experienced a partial recovery, but remained bearish as most sectors recorded a downward trend. The shares of most Australian banks were in positive territory, with the exception of the National Australia Bank. On Wall Street, equities experienced sharp declines and continued their October negative trend. Dow Jones Industrial Average, S&P 500 and Nasdaq Composite were down. During Friday's Asian trading session, the euro hit a week-long low against the dollar. The European Commission's criticism of Italy's populist budget raised new concerns. Oil prices rose on Friday due to increased demand from China, the world's second largest oil user. However, prices are falling, for the second week in a row, amid concerns about the ongoing trade war between China and the United States that is limiting overall economic activity. Gold prices rose during Friday's Asian session, as Asian equities fell on renewed political and economic concerns, including China's weak growth. Gold is approaching its third consecutive weekly gain. European markets are expected to open Friday's trading session lower. In the reading of the minutes of the last meeting of the Federal Reserve there was firmness regarding the rate hikes. There is a contrast to the data that is appearing, such as the average of 30-year loans above 5% interest or the collapse in 2018 of construction permits. The banks have not been the worst of the day, but the technological ones again take centre stage. If in recent times the technological ones are the ones that have had more profit, the arrival of problems will suppose strong collections of profits, with the consequent reductions. The most worrying thing is that the index of small and medium enterprises, the Russell 2000, continues to have strong losses. This is bearing in mind that they are the ones that have benefited the most from the evolution of the economy and from the lowering of taxes. Was a negative session in Europe on Thursday 18 October, once the resistance zone formed by the September lows has been touched. 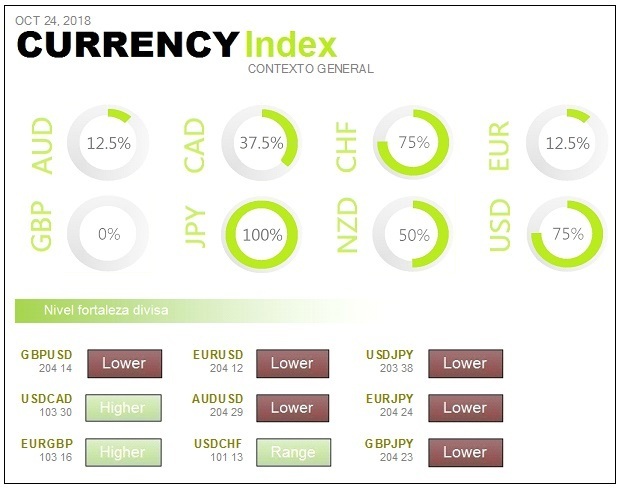 On the table exactly the same as on other occasions: uncertainty with the exit of the United Kingdom from the European Union, approval of the budgets of Spain and Italy and the resurgence of concern over the increase in interest rates in the United States. Most worrying of all is the news that budgets could have been prepared in Italy and Spain that are ready to be approved by Europe, but which in the end would be breached by governments. This would low confidence in the current government teams and lead to an increase in interest rates that would end up negatively affecting the economies. Entering into a cycle of rate hikes should be positive for the banking sector. However the banks have been seriously touched in the Ibex 35 when the Supreme Court said that these are the ones who should take charge of mortgage taxes. This path goes between doing too much too soon or too little too late. The European Central Bank believes that European countries have no time to lose in taking measures to reduce the impact of population ageing on the economy. This is what Peter Braet, a member of the body's powerful executive board, said. He adds that the monetary policy of the European Central Bank should not be the sole responsibility for financial stability. The stabilisation policy has been left too much in the hands of the central banks. So far these bodies have had to implement imaginative measures to tackle the crisis and the slowdown of economies. The prices of diesel and gasoline have risen this week to a new annual record. They do so after rebounding more than 1%. They are reaching highs they haven't seen since October 2014. This increase in price is part of the upward spiral in which crude oil prices are immersed, after a few weeks ago to rebound strongly to the decision of the Organization of Petroleum Exporting Countries not to increase production. The European Commission doubts the Spanish Government's accounts for 2019 and will send a letter shortly asking for more explanations. This does not mean that the EU Executive will overthrow the budgets, something that has never happened before in the European Union, but it does mean that in Brussels they need more explanations to be able to believe them. The misgivings of the Community executive are centred above all on taxes. There are going to be more countries receiving this kind of letter, including Italy. British Prime Minister Theresa May admitted that the European Union and the United Kingdom are considering extending the Brexit transition period for a few months to ensure that there will not be a border between Northern Ireland and the Republic of Ireland. This transitional period is now fixed from 29 March 2019, the planned departure date, until 31 December 2020. Asia Pacific markets were bullish during Monday's session on October 22, with China's main indices rising more than 4 percent. The Shanghai composite rose on what was probably its best day since March 2016. Rises in Chinese markets came after the authorities took action to support the market, following the release of weaker than expected GDP data. In Japan, the Nikkei 225 erased previous losses. The ASX 200 also recovered from some of its previous losses, but still traded lower amid new uncertainties in the country's political outlook. Most sectors traded lower, with the financial sub-index and the energy sector declining. The Dow Jones Industrial Average rose on Friday, thanks to solid gains from Procter & Gamble. Wall Street tried to recover its level, after strong sales in the previous session. 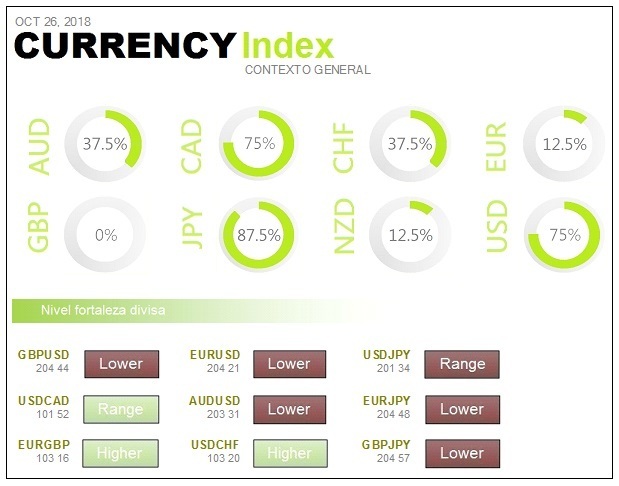 During Monday's Asian trading, the euro and the pound fell against the dollar as investors waited for developments around the Brexit and Italy's budget plan. The Italian budget has been subject to strong criticism from the European Union. Oil prices remained stable in Monday's Asian session. They were supported by uncertainty over the level of supply before the start of US sanctions against Iran's crude oil exports. The increase in drilling activity in the United States, however, contributes to the fact that prices do not rise beyond what is desired by the Americans. Gold prices rose in the early hours of Monday, approaching the two-and-a-half month high reached last week. Asian equities fell amid rising political tensions, and concerns about slowing global economic growth, benefiting safe assets. Dow Jones Industrial Average rises on Friday, October 19. Wall Street tried to recover, after the strong sales of the previous session. The start of the day was not so good, because China's gross domestic product for the third quarter had been known to have dropped to 6.5% year-on-year. The feeling that the effects of the trade war were continuing could not be offset by an increase in retail sales, which were higher than expected. In the macroeconomic section, it should be noted that the figure for second-hand home sales in the United States was much worse than expected. This is one more piece of real estate data, which adds to the tension that is being felt by the increase in interest rates. Let's remember that mortgage rates are already around 5% and building permits are plummeting throughout the year. The session in Europe on Friday 19 October ends mostly in negative territory. The future of the Ibex 35 has been spared the losses, thanks to a strong positive movement of banks. However, in the rest of Europe the negative part has come from the collapse of automotive and spare parts that has suffered, in Germany and France, a fall of 3 percent. The banks continued to have problems because there is a lot of uncertainty about what Brussels can say about Spain and Italy. There have been strong bearish movements in periphery debt futures. However, news appeared that Brussels wanted to continue negotiating with Italy. This has led to a reduction in tension at the end of the session. The future of Italy's ten-year debt rose 122 points. Every time there is an attempt to defuse the tension with European partners, money goes into Italy to hunt for high returns. Spanish banks have been protagonists, first because of the bad news that they had to take over the payment of mortgage taxes. However, there was news that the Supreme Court's ruling would be reviewed because of its high social and economic implication. This has supported the Ibex, which has been one of the best in Europe. The current account balance of the euro area had a surplus of 24 billion euros in August, 27.9% less than in the same month in 2017. Services recorded a surplus of 9 billion euros. China's economy is growing more slowly than expected, in line with government forecasts. This indicates that the world's second largest economy is feeling the impact of the trade war with the United States. Growth is the weakest since the first quarter of 2009 and falls two-tenths of a point from the previous quarter. This lower growth was predicted by analysts, although they predicted that the slowdown would be 6.6%. More fiscal and monetary easing policies will be needed to stabilize growth. The bank has turned around, after learning that the Supreme Court could rectify its decision on the mortgage tax. The six entities present in the Ibex 35 have begun to rise strongly, exceeding at times 2%. All suffered in Thursday's session great falls impacted by the decision of the high court. It will not be Brussels that cuts Italian budgets. It will be the market. If this continues, the losses that the Italian economy could have would be greater than the supposed profits of the budgets that are presented. The head of the Italian banking association has just warned that the banks cannot resist the constant growth in the profitability of Italian bonds. Asian markets fell on Tuesday, October 23, as investors remained cautious amid rising global tensions. China's markets were in negative territory early in the session, after seeing strong gains in the last two sessions. Any stimulus from China should not be seen as an impulse, but as a buffer against the weakening of an economy affected by external shocks. In South Korea, the Kospi fell more than 2 percent, touching record lows since March 2017. In Japan, the Nikkei 225 was also bearish. Australia's ASX 200 fell, with the financial sector and the energy sub-index in negative territory. A Saudi official this weekend offered a new account of the death of journalist Jamal Khashoggi. This version departs from Saudi Arabia's official statement. Khashoggi's death has brought harsh criticism to Saudi Arabia and has had a domino effect on global markets. The Dow Jones Industrial Average and the S&P 500 closed down on Monday, as the shares of the major banks fell sharply. Concerns about this week's avalanche of corporate results, and rising geopolitical tensions, have negatively influenced investor sentiment. 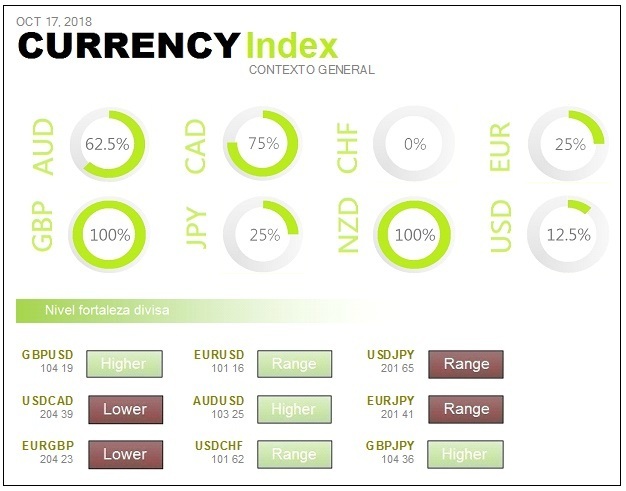 During Tuesday's Asian trading session, the dollar rose against most currencies, while uncertainty over the Brexit negotiations and Italy's budget caused investors to move away from the euro and the pound sterling. The British Prime Minister said on Monday that most of the agreement had been closed, but reiterated her opposition to a European Union proposal on the Irish border. Oil prices remained stable on Tuesday as Saudi Arabia pledged to play a responsible role. Nonetheless, uncertainty remains over the start of US sanctions against Iran's crude oil exports that will begin next month. Gold prices rose in Tuesday's Asian session, while Asian equities weakened, overburdened by political tensions between Saudi Arabia and Western powers, uncertainty over Brexit and Italy's budget problems. Wall Street turns downward on Monday, October 22, after starting the session with a moderate rebound. All this in the beginning of a week in which the business results of large companies in the technology sector will focus the attention of investors. The market closed with a mixed sign last Friday and fails to recover the falls accumulated by the Dow Jones and the S&P 500 in October. In the case of the Nasdaq, the monthly loss is above 7%. On an economic level, one of the protagonists is Netflix. The company's shares fall around 3%, after announcing that it plans a bond issue for 2,000 million dollars. In the commodities market, oil is rising in response to Saudi Arabia's plans to raise the price in retaliation for the West's protest against the Khassogi case. A bullish session in Europe on Monday 22 October but, little by little, the day's highs were lost. This is an extraordinarily complicated moment, because the current scenarios are all negative. This feeds uncertainty, which is not good when growth prospects have been reduced. There is a lot of money coming into the secondary debt market, both from Spain and Italy, which is driving down rates. The rating agency Moody's has downgraded the rating to Italy, but keeps the outlook stable. Once again there is the hunt for returns, which has been felt in both the Spanish and Italian markets. Banks have benefited from this situation, but the instability of the sector, directly linked to the yield and behaviour of public debt, is favouring sales. The yield on the 10-year American bond slackens slightly to 3.18%. The survey of fund managers, conducted by Bank of America Merrill Lynch, indicates that professional investors have not changed their fundamental view of the market. Only if the yield on this bond exceeded 3.7% would there be a massive rotation from the stock market to the bond market. The increase in short-term bond yields translates into increased competition for capital. The Federal Reserve's monetary policy, which includes gradual increases in interest rates, together with trade tensions between China and the United States, has helped trigger the collapse of stock markets. On Wednesday, the release of the leading indicators for the service and manufacturing sectors will be released for the month of October. Also to be released are September's new home sales and weekly U.S. crude oil inventories, as well as the Fed's Beige Book. On Friday, the preliminary GDP for the third quarter will be released from the U.S., which will be the most important figure of the week. The consensus expects growth of 3.3%, after an impressive 4.2% in the second quarter. The cause is due to Baker Hughes' count of oil installations, which shows a new rise. The overall figure would be above recent highs. There appears to be an acceleration in US production, in an attempt to compensate for the general lack of supply. The imminent sanctions against Iran are weighing heavily on the situation in the energy sector. The British Prime Minister defends herself against rumours of a rebellion within her Conservative Party. A new day of tension in the UK, with the pound falling at the risk of Theresa May's government being displaced in full negotiations. The Prime Minister goes to the House of Commons with the aim of buying a little more time to close an agreement that allows an orderly exit on 29 March 2019. According to Downing Street, the conservative leader will tell parliamentarians that almost the entire agreement has been reached. Including the future of Gibraltar, security coordination, respect for Europeans' right of residence in the UK and the continuation of the British military base in Cyprus. Only the customs relationship between the Republic of Ireland and the British province of Northern Ireland remains to be determined. London and Brussels agree to avoid introducing controls at that border, but the two sides have different solutions. Asia traded higher on Wednesday, October 24, following a turbulent morning session in which most stocks oscillated between gains and losses. China's markets recovered. Hong Kong's Hang Seng index won, Shanghai composite advanced and Shenzhen composite also rose. In South Korea, Kospi traded almost flat. Heavyweights such as Samsung Electronics and SK Hynix were bearish. The ASX 200 struggled to make profits, while the financial sector rose and the energy sub-index was weak. The United States and China have implemented tariffs on billions of dollars in their products this year, raising costs for businesses and raising fears that tighter trade conditions could slow the global economy. Negotiations between the two countries have stalled recently, raising fears that this dispute will continue. Concerns about U.S. corporate profits hit the Dow Jones Industrial Average and the S&P 500 on Tuesday. Despite everything, losses had been reduced by the close. The most important week of the business results season is coming up. More than 150 members of the S&P 500 publish their results. Of the companies that have reported so far, 79.6 percent have outperformed analysts' earnings estimates. 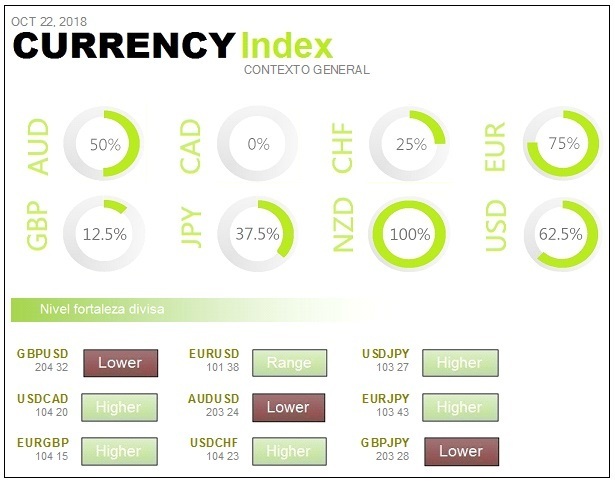 On Wednesday, the Japanese yen and Swiss franc held firm against the U.S. dollar, as investors were reluctant to take risks and cut their exposure to the dollar in the face of a weak session on Wall Street. On Wednesday, oil prices fell significantly from the previous day, when crude oil fell by as much as 5 percent. This comes after Saudi Arabia said it will make up for supply disruptions caused by U.S. sanctions against Iran's oil exports. Gold reached a three-month high during Wednesday's Asian session, while international political and economic uncertainty underpinned demand for the metal as a safe haven. U.S. Stocks fall sharply after 500 point loss in Dow. Stocks fell on Tuesday 23 October as Caterpillar and 3M's corporate results disappointed investors. However, the market managed to recoup most of its losses at the end of the session as investors rotated to McDonald's and defensive stocks like Procter & Gamble. At session lows, the Dow had fallen 548 points, while the S&P 500 and Nasdaq had lost more than 2 percent each. On the upside McDonald's, Procter & Gamble and Coca-Cola led the way. The S&P 500's consumer staples sector rose. A very negative session in Europe on Tuesday 23 October, where practically all the factors that could do damage came together on the same day. 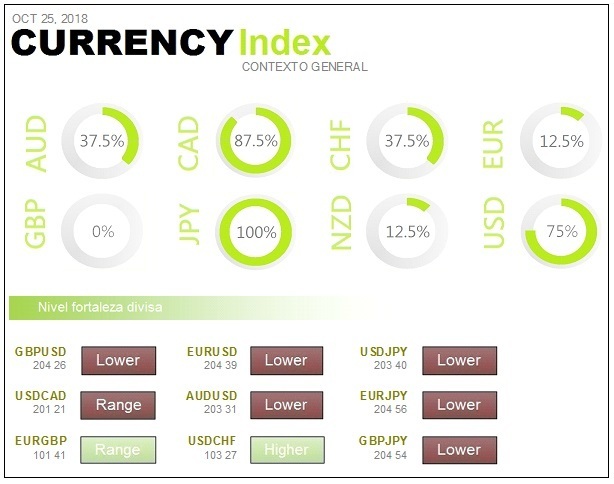 Italy has seen its budget rejected by the European Commission, bad business results have appeared, crude oil has created new monthly lows and, in addition, geopolitical tension has grown between the United States and China. It is striking that the European Commission has rejected Italy's budget for 2019, the first time this has happened in Europe. It has been said that that country is aware that it is breaking the rules. It is shameful for the political class, which should be the point of reference for someone who meets the rules. If we look at the market from the inside, all supersectors are in negative, with the technology sector being the worst of all. It is official, the European Commission has asked the Italian populist government to send a new draft in the next three weeks. The request comes after it has been established that the initial budget clearly and intentionally infringes the fiscal rules of the European Union. This is the first time that the Community executive has used the prerogative of rejecting budgets and it is an historic moment. However, the Commission has no effective veto power over national accounts and the Italian Government is free to go ahead with those budgets. The public deficit in the eurozone was reduced by one tenth in the second quarter of the year to 0.1% of GDP. It is its lowest level since the start of the historical series in 2002. In the European Union as a whole, the public deficit fell by two tenths of a percentage point from the previous quarter to 0.3% of gross domestic product. It is also its lowest level since 2002. It has put fear again in the markets. American warships crossed the Taiwan Strait and were closely followed by Chinese ships. This is reminiscent of the struggles between the United States and Iran in the Ormuz Strait. As if that were not enough, China has turned around eliminating the previous optimism. A lot of business results have come out. In general they did not like it. This has added an extra bearish weight to the one that had already existed for weeks. If we look at the market from the inside, the vast majority of supersectors are in negative. The technology sector is the worst of all, with a decline of almost 3.7%. The results of AMS have not liked and the value has fallen more than 15%. In addition, Apple suppliers are having serious problems. In the automotive sector, Renault has given disappointing sales figures and joins Michelin's bad run. The poor performance of this sector is a major problem for the German index. Bayer is plummeting more than 8% due to legal problems. Infineon is also down 5%. Downgrades above 1% are very abundant in the DAX. Asian equities declined broadly on Thursday, October 25, after a sharp drop on Wall Street. China's markets remained in negative territory. The grim U.S. session extended to Asia with stock markets from Japan to Australia sinking deeply. Over the past week, nervousness about US corporate results and geopolitical uncertainty added to growing concerns about global growth, Italy's budget and trade tensions between China and the US. On Wall Street the S&P 500 fell for the sixth day in a row. It does so as weak forecasts from chip manufacturers add to concerns about the impact on tariff profits and the slowdown in the Chinese economy. In addition, sales of new single-family homes in the United States fell in September to their lowest level in two years. The latest signal indicates that rising mortgage interest rates, and rising prices, are affecting demand for housing. 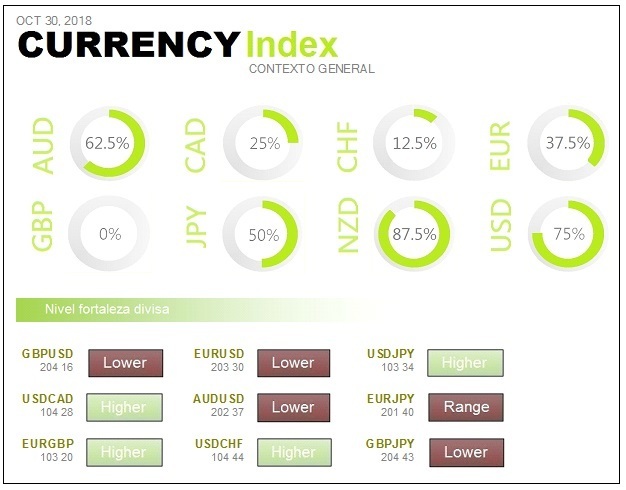 The Japanese yen rose against the dollar, as economic data from Wall Street, Europe and the U.S. affected global risk appetite. This led investors to take refuge in safe assets, such as government bonds. Oil prices fell by about one percent in Thursday's Asian session, under pressure from strong sales in global equity markets, with U.S. equities recording the largest daily decline since 2011. Gold reached a three-month high during Thursday's Asian trading, while the U.S. dollar fell and the Asian market fell. The rise in safe haven equities comes after Wall Street gave up all of its gains accumulated during the year. On Wall Street the S&P 500 fell for the sixth consecutive day on Wednesday, October 24. It does so as weak forecasts from chip manufacturers add to concerns about the impact on tariff profits and the slowdown in the Chinese economy. In addition, sales of new single-family homes in the U.S. fell in September to their lowest level in two years. The latest signal indicates that rising mortgage interest rates, and rising prices, are affecting demand for housing. Boeing's results have been better than expected and that has tried to encourage a lot, being one of the fundamental pillars of the improvement of the Dow Jones of industrialists. However, the reality is that there are more results against than in favour. We must remember the strong crashes of Tuesday by 3M and Caterpillar. Europe was negative on Wednesday, October 24, due to poorer business results and bad macroeconomic news. In addition, the situation in Italy has not yet cleared up. The session started negatively, with Deutsche Bank's results triggering the banks' bearish turn. This sector has been a drag throughout the day. Salvini's new comments that they are not going to backtrack on budgets have weighed negatively. The preliminary reading of the purchasing managers' indices for the month of October has been known throughout Europe, and there has been no good news. The calculation of the eurozone falls again, along with Germany. The commercial activity of private companies in the euro zone falls to two-year lows and the slowdown in exports is spreading to the service sector. For the IHS Markit experts these data present a bleak picture, as they indicate that the slowdown in manufacturing is spreading. The pace of economic growth in the euro zone slowed significantly in October and the PMI index paved the way for a disappointing year-end. An export-led slowdown continued to infect the services sector and business expectations for future growth fell to a four-year low. Lower optimism weakened job creation and inflationary pressures rose to seven-year highs. Optimism fell especially in the manufacturing sector, although it also declined sharply in the services sector. New home sales are down again more than expected. The same goes for building permits. You have to remember that Trump has increased the pressure on the Federal Reserve. Now he's directly messing with the president of the Federal Reserve for making new interest rate hikes. One of the important dangers of the American economy is that the real estate sector starts to slow down, because of the difficult access to financing. The automobile sector will be the most affected by Brexit, according to British and Spanish companies with interests in the United Kingdom and Spain. The British Chamber of Commerce warns of the coup for a strategic sector, because of the difficulty of moving parts at the border. Recruitment will also suffer. Conditions will worsen with the Brexit and, if there is no agreement, they will also do so in a violent manner. Five months of absolute uncertainty are ahead. The companies are in the hands of the House of Commons. If it do not endorse the agreement that Theresa May brings, they will suffer the rigours of hard Brexit. The leader of the far-right League, and Italy's Minister of the Interior, says the Italian government will not change its budgets for 2019. From Brussels they can send twelve letters but the budgets will not change, Salvini said in a statement on the radio. He considers that all the budgets that have passed through Brussels in recent years have increased Italy's debt by 300 billion euros. He defends the Executive's strategy of increasing public spending to boost growth. Italy has drawn up targets for 2019 that foresee a deficit of 2.4% of GDP, a debt of 130% of GDP and a growth of 1.5%. These are numbers that worry the Commission, which considers that growth is too optimistic so there is a risk that the deficit and debt are higher. Asian markets traded lower on Friday, October 26, as the main indices moved between gains and losses, as analysts wonder if the rally will last. In China, stocks fell into negative territory at the end of the session. Japan's Nikkei 225 lost its initial gains. Australia's ASX 200 declined, with the financial sub-index in negative territory. Movements in Asia followed rises on Wall Street, although analysts were skeptical of any possible recovery. The ECB reaffirmed on Thursday that its €2.6 trillion asset purchase program will end this year and that interest rates could rise after next summer. 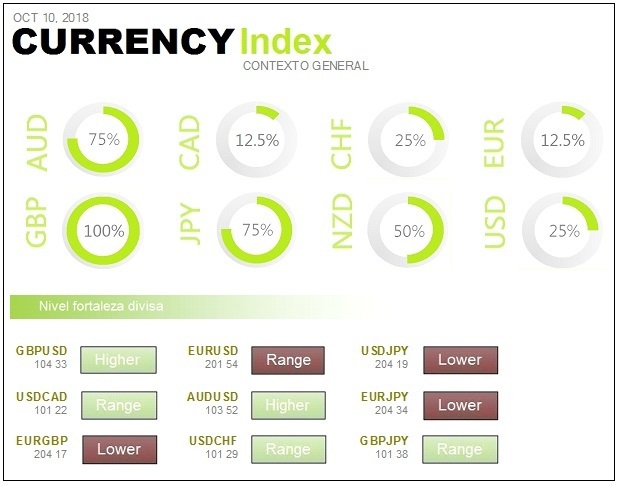 The ECB's guidance has been consistent since June, despite the worsening economic outlook and as political turmoil in Italy looms over the common currency block. Analysts believe that markets remain skeptical about the ECB's interest rate hikes, as the inflation target has not yet been reached. The real expectation is that interest rates will remain at current levels in the medium to long term. Thursday's rally in U.S. equities came after last session's massive sales did not continue in Asia. This gave support to the safe-haven currencies. Analysts continue to see persistent risks to the markets. They include trade tensions, Italy's budget problems, geopolitical uncertainty and concerns about US corporate results. Risk sentiment remains quite fragile. 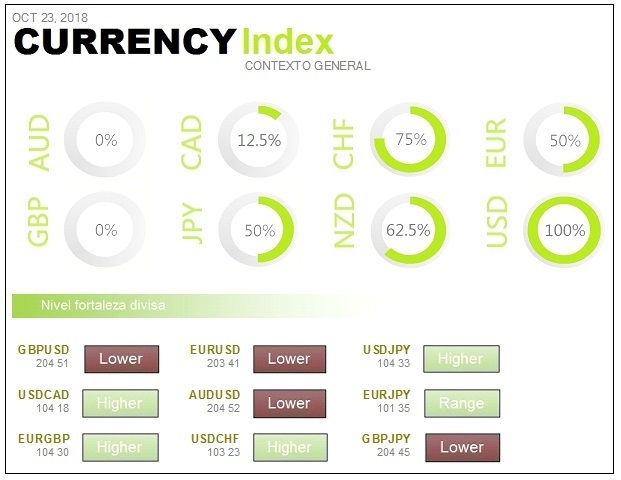 During Friday's Asian trading session, the Japanese yen rose against the dollar, while the euro remained at a two-month low after the European Central Bank failed to convince the markets that interest rates would rise. The Australian dollar, often seen as an indicator of risk appetite, hit a 33-month low. Oil prices fell on Friday and are heading into their third consecutive week of declines. Saudi Arabia's OPEC Governor said the market could be affected by oversupply soon. In addition, the decline in global equities is clouding demand prospects. Gold remained stable on Friday, but on the rise for the fourth consecutive week. It is the longest series of weekly gains since January, amid growing concerns about corporate earnings of American companies and the global economic slowdown. European markets are expected to open mixed on Friday. Stocks rose as Wall Street recovered from the previous session's downturn. The U.S. market made a correction on Thursday, October 25. However, the outlook remains bearish. Several factors have a negative impact on the markets: disappointment at poor business results, fears of rising interest rates, growing conflict between Italy and the European Union, criticism of Saudi Arabia and concern that global growth is losing strength. Bullish session in Europe on Thursday 25 October, thanks to good business results within the technology sector in the United States. After Wednesday's sharp decline in all markets, especially in the US, reasons are being sought to generate a rebound. After the end of the trading session, important results were presented, which gave a first upward movement. At the European Central Bank hearing, Draghi acknowledges that uncertainties are still high. The most important thing about the appearance is the reference to the 'weakest current economic moment'. He has often mentioned this subject which he considers to be caused by the trade wars, the Brexit, Italy and the emerging crisis. But he has made it clear that, for now, are not enough factors to change the forecasts and monetary policy of the entity. On the subject of Italy, he has shown himself to be moderate. He acknowledges that it is hurting Europe, but that it is limited. He said, on a personal note, that he is convinced that there will be an agreement between Italy and the Eurozone. The European Central Bank's monthly meeting with the markets comes this October in the midst of the Italian budgetary crisis. Unanimity is absolute in the sense that the president of the monetary supervisor, Mario Draghi, remains faithful to the plans of the entity. In the press release he spoke of the uncertainties and this has been added to the bad PMI of October, which came out recently. The most important thing about Draghi's appearance is the reference to the 'weakest current economic moment'. He considers that this weakness is caused by the trade wars, the Brexit, Italy and by the emerging crisis. However, he has made it clear that these factors are not sufficient to change the central bank's forecasts or monetary policy. Economic data will be reviewed in December to see if the current moderate optimism is maintained. Moreover, according to Draghi, the inflation target remains attainable. He assures that not even a possible extension of the QE has been debated, so it will end in December. However, the European Central Bank will continue to buy back at maturity. On the subject of Italy, he has shown himself to be moderate, acknowledging that there is damage. However, he says that the damage is limited. On a personal note, he is convinced that there will be an agreement between Italy and the Eurozone on budgets. The U.S. economy continues to expand at a moderate pace. The Beige Book notes that economic activity has continued to expand at a moderate pace. It does so despite the fact that there has been an increase in the price of raw materials and that it is difficult to find skilled workers. The economic dossier indicates that manufacturing production has increased, despite uncertainty regarding the cost of materials and shipments. Consumer spending has increased at a modest rate. In addition, travel and tourism have continued their upward trend in almost all districts. Only North Carolina and South Carolina, affected by Hurricane Florence, are left out of the upswing. The natural disaster has also had consequences on agricultural production, which has been mixed. However, some farmers have stressed that the rains were beneficial. With regard to employment, it has been noted that there is a general lack of labour in the country. Companies have difficulty hiring engineers, sales and finance professionals, manufacturing and construction workers, as well as truck drivers. It is the level of the Italian risk premium where the pressure on the government would be unbearable. It is a great incentive for strong hands to get long in the German bund and, at the same time, short in the Italian bund. When the spread reaches 400 points, which it will surely reach, they will go against it. The Italian government does not have much chance of opposing the situation that lies ahead. Sooner or later the market will dictate the changes, and they will have no choice but to moderate budgetary expenditures. It is not known whether it is a good strategy to turn the markets upside down and, in the end, give in. The Italian banking sector is suffering terribly badly and this is spreading to banks all over the continent. The outflows of money from the strong hands of Italy must be monumental at this point, remembering the stories of the corralito. Some media report that the Italian-speaking part of Switzerland is capturing Italian bank customers leaving their country. New decline in business climate, according to data from the IFO Institute. The business climate in October, calculated by the IFO Institute in Germany, gives a reading of 102.8 from 103.7. 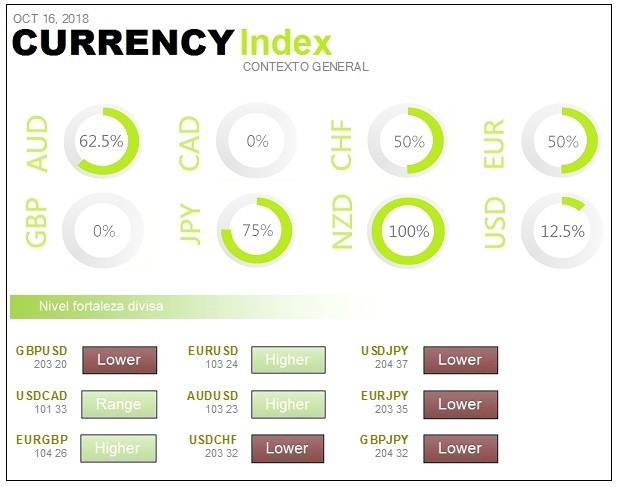 The current condition indicator is also worse than expected. The expectation indicator has a new decline. All are worse than expected. As a result, the Dax has hit lows since December 2016. Asian markets were mixed on Monday, October 29, at the same time as the main Chinese indices were falling. Shanghai composite was down and Shenzhen composite has fallen at the end of the first part of the session. In Japan, the Nikkei 225 was trading down. The South Korean Kospi was also bearish. In Australia, the ASX 200 benchmark index rose slightly, with all sectors on the rise. With global equity markets suffering a massive sale in October, led by technology companies, analysts' forecast for November is again favourable to equities. Right-wing extremist candidate Jair Bolsonaro won Brazil's presidential election on Sunday. He has promised to clean up politics, reduce state spending and crack down on crime, in a dramatic turn from one end to the other within the Brazilian political spectrum. The U.S. Treasury Department said in a recent report that it finds no major trading partner that meets the criteria to be designated as an intentional manipulator of its currency. But it kept China in a group of watched countries along with Germany, Japan, Switzerland, Korea and India. The development of U.S. stock exchanges is being taken very much into account in the foreign exchange market. When Wall Street falls, emerging market currencies tend to fall as well. During Monday's Asian trading session, the Dollar rose against most of the major currencies, reaching a ten-week high. It does so after U.S. economic data showed a slower-than-expected economic slowdown and global risk sentiment remained fragile. The U.S. currency has found support in buying safe-haven stocks, as demand for riskier assets was affected by falling global equity markets, concerns about corporate earnings, geopolitical uncertainty and global growth. Oil prices remained stable on Monday. They were supported by an initial rally in Asian equities. Analysts maintain that sentiment remains cautious after last week's fall in financial markets. There is a fear that global growth may be slowing. In Monday's Asian session the price of gold fell, to move away from the highs of the previous session of more than three months. It came under pressure as the dollar took hold and Asian equities rose again after the weak week before. The S&P 500 corrects and then recovers on another wild day on Wall Street. On Friday, October 26, equity markets recovered most of their previous decline in another volatile session on Wall Street. The Dow Jones Industrial Average recovered, after falling more than 500 points in the day. The Nasdaq Composite dropped slightly, at its lowest it had lost more than 3 percent. The S&P 500 had a slight drop, having been down 10 percent. Despite the recovery, six of the S&P 500's eleven sectors were still at least 10 percent below their 52-week highs. These included energy, materials and finance. We are under the influence of tax cuts, but everyone is already warning that the effect will gradually fade away. Some data advance the new situation. The first reading of North American gross domestic product has come out, from the third quarter, which has been slightly worse than expected but well below the reading of the previous quarter. Session that ends in negative in the European market on Friday 26 October, also in the session shared with the United States. The focus of all concern has been mixed, as there have been some good results, such as those of Amazon and Google. Although in these two companies the problem is the outlook for the last quarter, where there is the greatest economic activity of the year. There have been no scares in Europe, despite a slight slowdown in industrial production prices in France, the decline in consumer confidence in this country and the loss of consumer confidence in Germany. Another negative session that opens the door to seek the minimums of the year. Compound PMIs have disappointed and Draghi's words were not exactly a support. On a technical level it seems that the RSI direction pushes to look for oversold near the support. This decrease has been very frightening, because the lower taxes and the bad international environment made part of the good prospects come from the hand of SMEs. This has been the case for a long time. However, the Federal Reserve's rate hike has led to a worsening of credit conditions, which directly affect small and medium-sized enterprises. Amazon and Alphabet have disappointed. It wasn't because of their results, but because of the sales prospects in the last quarter of this year. Christmas is the busiest time of the year. Amazon expects sales in the last quarter of the year that move in a range ranging from a minimum of 66,500 million dollars to a maximum of 72,500. It is far worse than expected. The competition between Amazon and Google is a bigger brake than expected. What is happening is that many consumers are looking for a certain product directly on the Amazon website, instead of searching for it on Google. On the one hand, the entries in the search engine suffer and, with it, their income. On the other hand, the advertising that Amazon used to get through Google also drops. The Gross Domestic Product of the United States slowed in the third quarter to 3.5%, compared to 4.2% at the end of the previous quarter. This improves market expectations, which were expected to stand at 3.3%. The growth of the US economy in the last two quarters is the fastest increase of six consecutive months in four years. The U.S. economy is expected to expand above 3% in 2018, something that has not happened since 2005. President Trump has blamed the Federal Reserve for any slowdown that might occur. However, Jerome Powell made it clear that he wants to continue raising interest rates at a gradual pace. The economy continues to favour interest rate hikes. However, many people think that next year will see the end of the momentum created by the tax cut. It would be logical to see, from now on, a slowdown to more normal growth rates. The bad data of the real estate sector would be the beginning. Asian equities were mostly positive on Tuesday, October 30, as Chinese markets rebounded after comments from the country's securities regulator. Movements in mainland Chinese equities came after the country's securities regulator said it would improve market liquidity and move more long-term capital into equities. China's Securities Regulatory Commission also said it will encourage share buybacks and mergers and acquisitions of publicly traded companies. It will also reduce unnecessary interference in trading and create a level playing field for investors. This simply means that fiscal policy is more expansionary and raises concerns that China's fiscal deficit may widen further. Again, a negative factor is added for the Yuan. In Japan, the Nikkei 225 was positive and does not appear to be due to Japan's economic data as it only has a marginal impact on stock markets. Many Japanese companies derive most of their income from overseas activities. The Australian benchmark, the ASX 200, recovered to end up trading higher, with most sectors making gains. On Wall Street the indices closed down, after a report said the United States is preparing new tariffs against all Chinese imports that did not yet have them. This measure will become effective if trade talks between Presidents Donald Trump and Xi Jinping fail to reconcile the positions of both countries. The US-China trade war looks set to intensify in the coming months and its influence on world markets remains one of the most important factors influencing investor confidence. While Chinese markets have suffered a tough month in October, investors have also been watching the country's currency closely. 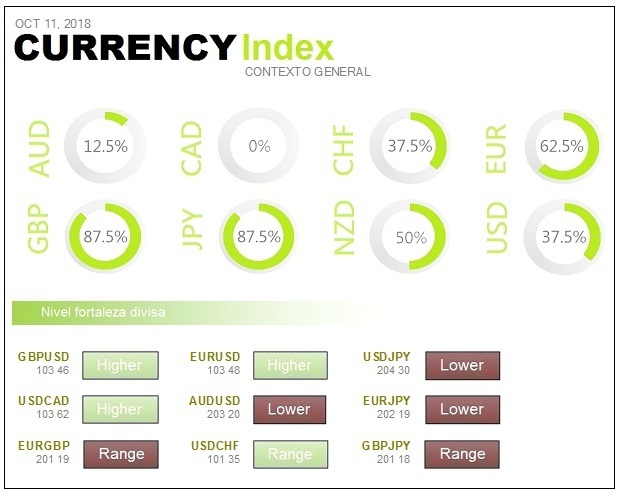 The US dollar index, which tracks the performance of the dollar against a basket of major currencies, stood at 96.638 after hitting a low in the previous session. In Tuesday's Asian session, oil prices fell, due to weak global stock markets and signs of an increase in global supply despite imminent sanctions on Iran's crude oil exports. During Tuesday's Asian session gold depreciated, as the dollar strengthened and fears of an intensification of the trade war between China and the United States grew. However, the negative perception of global economic growth is likely to favour safe haven stocks. U.S. Stocks closed down on Monday, October 29. U.S. indices gave up strong gains early in the day in a wild session in which the Dow Jones Industrial Average ranged more than 900 points. The S&P 500 closed 10 percent below its recent high. Traders blamed the possibility of more U.S.-China tariffs, along with a drop in technology stocks. The Dow fell in the end, erasing an initial gain of 352 points. At the day's low, the Dow lost 566 points, before recovering shortly before closing. A bullish session in the European market on Monday 29 October but, in the final part of the coincidence with the United States, the technologies once again had problems. It is one of the few occasions where Europe has disassociated itself from the behaviour of the United States. It has been because of the banking supersector and the automotive and spare parts sector, which have had powerful rises. The banking sector has been influenced by HSBC's positive results, dragging the whole sector upwards. In addition, S&P maintained Italy's credit rating, so that the Italian banking sector also supported all the others. The downside comes from Germany, because of Angela Merkel's public recognition that she will not run for a new mandate. This opens the door to more instability within the country and to doubts about the viability of the European project. According to Trump, every time his government does something important, the Fed raises the rates. Other US presidents have openly criticised the leaders of the Central Bank, but no one can escape the fact that the current criticisms have as a backdrop the proximity of the mid-term elections in the United States. The American president says that 'it seems that Powell is happy to raise the rates'. These rises pose a threat and he has gone so far as to say that he regrets having named Powell. These criticisms do not seem to be based on technical aspects but rather on political issues. What they are trying to do is divert attention, making it appear that the Federal Reserve is to blame for a possible cooling of the US economy in the near future. Nomura says that, in eight of the last nine days of each month, the euro has declined due to strong hand portfolio adjustments. The euro has a lot of volatility because of Germany. It is confirmed that Merkel will not seek a fifth term. The nerves are clear, so this may represent for the European project. In this situation the door can be opened to more political instability. From the investors' point of view, GDP is not so positive as it gives excuses to the Fed to raise interest rates. The impact of the tax reform fades and the economy's loss of momentum is appreciable. The improvement in GDP this year, partly achieved by tax cuts, will have a limited effect. The lowering of taxes is not generating the desired activity and, moreover, is accompanied by an increase in spending. In the end it will lead to lower revenues for the State and this increase in the deficit will have to be financed by the American Treasury. The stock indices closed another week in negative, after a lot of nerves and a strong rise in volatility. The Nasdaq has closed negative each of the last four weeks. The FAANG phenomenon has weakened and the correction of the big market icons is taking its toll and dragging others along. Meanwhile, China's macroeconomic data is not exactly encouraging. However, it has been very pleasing to see that they continue to take steps to try to sustain the economy. For example, they have reduced taxes on car purchases by 50%. It seems that the worse the economy goes, the more the Chinese government is involved in sustaining it. This data is taken as something very positive. Asian equities showed positive territory on Wednesday, October 31, pointing to a positive end in what has been a disastrous month for equity markets. China's markets, which were previously hard hit, recorded gains at the end of the session. The upward movements in China occurred despite the country reporting lower-than-expected manufacturing growth in October. Japan's Nikkei 225 rose. Australia's ASX 200 benchmark remained virtually unchanged, with the energy sector advancing and materials falling. The heavily weighted financial sub-index rose and the shares of the so-called 'Big Four' Australian banks recorded gains. South Korean Kospi remained virtually unchanged, with heavyweight Samsung Electronics' shares declining. In Tuesday's session, the U.S. stock market advanced strongly. October ends negative after a prolonged downward trend. The S&P 500 recovered more than 1.5 percent, with communications, energy and materials stocks supporting the index. On Wednesday in Asia, the Japanese yen fell against the dollar after the Bank of Japan indicated that the country is far from coming out of the crisis. It does so as the dollar reached a 16-month high against its main rivals due to the strength of the U.S. economy. The Bank of Japan (BoJ) maintained a stable monetary policy and cut its price projections, reinforcing market expectations. Moderate inflation forces the BoJ to maintain its stimulus program for the time being. The Central Bank kept its short-term interest rate target at -0.1 percent and pledged to maintain ten-year government bond yields at around zero percent. On Wednesday, oil prices rose for the first time in three days. However, rising supply and fears about demand prospects in the midst of the US-China trade war kept pressure on the energy market. Gold fell to a two-week low on Wednesday in Asia, while Asian equities rose and the U.S. dollar hit a several-month high following the release of U.S. economic data. European markets are expected to open Wednesday's trading session higher. U.S. has not been spared bad macroeconomic news. On Tuesday, October 30, it became known that the average housing price index in 20 American cities has remained flat. Not surprisingly, because the cost of mortgage financing has risen dramatically. During the whole of 2018, requests for building permits are falling sharply. This data could affect prices and the evolution of the Case Shiller indicator must be taken into account. Something that has pleased the market very well, and that has helped the United States to improve, is that the latest reading of consumer confidence from the Conference Board is at a maximum of 18 years. Technological values like Amazon have had problems again. However, Apple's introduction of new products and inclusion of new programs has tried to change the trend. In the end, the technology sector has improved and dragged in the rest of the sectors. Was a negative session in Europe on Tuesday 30 October, where the United States had to come to rescue Europe to keep it away from the minimums of the day. The season of results have some data that did not like anything. For example, there is Lufthansa's recognition that it is being affected by the rise in crude oil. Obviously, travel and leisure has been one of the worst sectors of the day. The real protagonist has been macroeconomic data, from preliminary readings of the CPI in October to the growth of gross domestic product in the third quarter. In the euro zone, the preliminary reading for the third quarter slows from 0.4% to 0.2%. In addition, all sentiment surveys in the euro area have fallen to worse than expected levels, so the overall picture is not positive. This is good data for the economy. October Conference Board consumer confidence leaves a reading of 137.9. It is better than the previous 135.3. The data is positive for the market because it encourages that there is internal consumption. It is good for the dollar and bad for bonds. The average price of homes in 20 metropolitan areas, calculated by Case Shiller, leaves no growth when it was expected to improve. The latter is a really bad data and puts the accent on demand. It is a bad year in terms of the evolution of building permits. In addition, mortgage rates are rising. All this indicates that something is wrong with the economy. The Agency says the lack of agreement could lead the UK into recession and damage some credit ratings. They consider that the threat of a lack of agreement has grown enough to make it a relevant rating consideration. The possible UK recession would last about 4-5 quarters, with GDP shrinking in both 2019 and 2020. The GDP grew by 0.2% in the euro area and by 0.3% in the EU as a whole in the third quarter of the year in comparison with the previous quarter. Analysts expected a 0.4% expansion in the euro area. It is also known that the Italian economy stagnated in the third quarter and rose 0.8% year-on-year. The economy is stagnating, after the expansionary trend of the last three years. Confidence in the economy of consumers and businessmen of the euro partners, and throughout the European Union, falls in October due to increased pessimism in industry, services and retail trade. Spain was the only country to register a clear increase in confidence among the large economies of the single currency. It experienced a rise of 1.9 points. This contrasts with falls in Germany, the Netherlands, France and Italy. Markets in Asia were mainly positive in the first November session, after strong up and down movements shook the region in October. China's markets were rising at the end of the first half of the session. These gains were supported by the Caixin-IHS Markit October Purchasing Managers' Index (PMI) report, which stood at 50.1 for the month of October. Analysts expected the reading to have dropped slightly to 49.9. The survey covers the country's small and medium enterprises and a reading above 50 indicates sector expansion. The Japanese Nikkei 225 remained in negative territory. Softbank's significant decline could be due to news of a Japanese rival's fees cut. In Australia, the ASX 200 benchmark lost much of its previous gains, to trade largely unchanged at the end. Even so, the materials sector gained 1.35 percent as the shares of major mining companies recorded gains. The U.S. dollar rose after the ADP showed that U.S. private sector payrolls increased in October. This confirms that the economy continues to grow at a relatively robust pace and reinforces expectations that the Federal Reserve will continue to raise interest rates. The British pound rose sharply on Thursday in Asia after the UK Prime Minister said they had reached an agreement with Brussels on financial services. The Dollar fell against the EUR during the Asian trading session, ahead of better than expected economic data. Oil prices fell in the Asian session on Thursday, extending the losses of previous sessions. They do so amid signs of increasing supply and concerns that demand could weaken, given the prospect of a global economic slowdown. Gold rose sharply on Thursday's Asian trading session from a three-week low. The United States has been supported by employment data. U.S. markets have been supported on Thursday November 1 by the ADP reading, which attempts to predict the October job creation figure that will be released on Friday. It left a reading of 227,000, which is well above expectations and higher than the previous month. This confirms the sensation of a good situation of the labour market. Salaries still have to be raised in order to retain and attract talent. In terms of results, General Motors liked the results, as did Facebook. Technology is waking up in the United States, after it caused heavy falls in previous days. At the European close the Nasdaq rose more than 2.3%. However, to see that Facebook has a stable number of users, both in the United States and Canada, arouses much distrust for the lack of growth. Banks have also been very active in the United States, because the Federal Reserve is preparing a new regulation tailored to each type of bank. From now on, the most stringent rules will be aimed at the largest banks and those with the strongest systemic danger. However, those with a low level of assets will have less capital requirements. A bullish session in the European market on Thursday 1 November, but there is a sense of lack of confidence in this rebound. 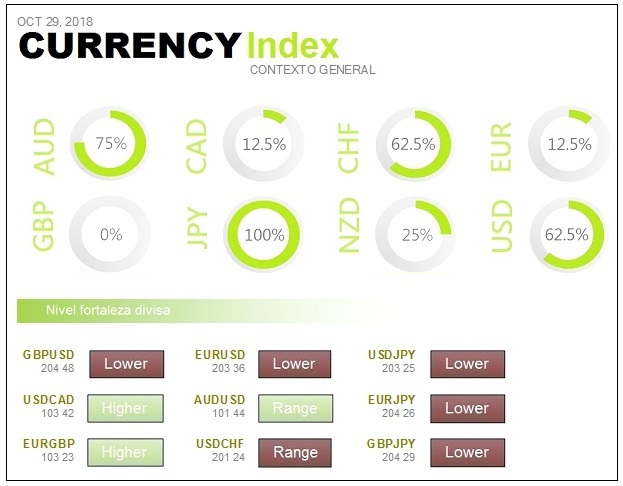 Business results and macroeconomic data have once again been the protagonists of the day, for both the positive and the negative. China's officially calculated purchasing managers' indices for manufacturing and services have been worse than expected. This gives further impetus to the idea that they are struggling to sustain the economy. It should be remembered that they are taking steps to boost the economy and, for example, they have reduced taxes on the purchase of cars in order to increase consumption. In Germany, retail sales have increased slightly to 0.1%, which is a long way from the 0.5% expected. In the euro zone inflation accelerated slightly. The reading is 2.2%, which helps the European Central Bank to make decisions. To see two consecutive months of net repayments you have to go back to January and February 2016, when the stock markets fell into panic over a new global recession and a sharp slowdown in China's growth. Now the September panic in the funds continues into October. After 30 consecutive months of raising money, the funds suffered their first setback in September, with net repayments of 297 million. In October, the figure is lower, but the fact is that investors' fears remain because of the generalised falls in the stock markets. The current risks lead investors to be in liquidity or in other less risky financial products. The unemployment rate remained stable in September, both in the euro area and in the European Union as a whole. Unemployment is 8.1% in the countries that share the single currency and 6.7% in the European Union as a whole. This is the lowest level for the Eurozone since November 2008 and for the European Union since the historical series of measurements started in 2000. It rises to 2.2% and represents the highest since 2012. The energy sector, the main component of the economic indicator, helped. Meanwhile, the price of fresh food also rose. In the case of services, these became two tenths more expensive than in September. Excluding the impact of energy prices, the inflation rate in the euro area stood at 1.3% in October and is the same rise as in September. The financial sector of the S&P 500 improves and the values of the banking sector of Philadelphia have significant improvements when the proposal to relax the legislation of entities with less than 700,000 million in assets is known. Among the securities benefited are US Bancorp, Capital One, PNC or Charles Schwab, which could enjoy less capital requirements. Those with less capital would also benefit. Stricter regulations would be reserved for the most important securities, and globally more dangerous, as far as systemic danger is concerned. On Friday, November 2, Asian stocks rose, thanks to Wall Street earnings and comments by the U.S. president indicating possible progress in his trade negotiations with China. Japan's Nikkei 225 rose. In Australia, the ASX 200 benchmark plummeted, with losses in the energy sector and a drop in the heavily weighted financial sub-index. China's markets jumped in the morning session. Those markets, which some are watching for the current US-China trade war, are inheriting a seemingly positive development from the US. The intention behind Trump's rapprochement movement is questioned. The timing is 'too coincidental' given that the midterm elections in the United States are only a few days away. Global equity markets began the month with a broad rebound, after a brutal October, driven by solid corporate profits and hopes of a thaw in the US-China trade dispute. This reduces support for currencies such as the dollar, which benefit in times of increased risk aversion. Investors are eagerly awaiting the release of U.S. employment data, which will be released on Friday, to gauge the pace of interest rate hikes in the United States. Apple's supplier stocks were also in the spotlight on Friday after the technology giant reported its quarterly results. Although earnings were better than expected, iPhone sales were worse than expected. During Friday's Asian trading session, the Dollar remained stable, awaiting the release of U.S. employment data and investors investing in riskier assets. Sentiment was also encouraged by news of a telephone call between U.S. President Donald Trump and Chinese President Xi Jinping. The pound remained bullish after the Bank of England kept interest rates stable while anticipating that, if there was a good Brexit, it would raise rates faster than expected. Oil prices fell during Friday's Asian session, as increased production by the world's three largest producers eased supply concerns. It is expected with interest to see what happens with the U.S. sanctions on Iran. During Friday's Asian trading session, gold remained stable after rising 1.5 percent in the previous session. European markets are expected to open up Friday's session. The most important point of November 1 is Donald Trump's comment that he has spoken to the Chinese President on various issues, including trade. That conversation has generated some optimism, coupled with an index of purchasing managers in China in the manufacturing sector that holds up in the expansion zone. This has been taken positively by commodities. However, the oil companies have been the worst of the day, seeing crude oil plummet by -2.4 percent. This slows down the rebound of a couple of sessions ago. The increase in production and the increase in weekly crude oil reserves are carrying a lot of weight. The counterpart to this is the supersector of travel and leisure, where the airlines and cruises are, because when the price of crude falls so much in the future there could be less costs. In the first session of November, neutrality in Europe was close to being achieved, but with a slight positive tone in anticipation of the figure for job creation in the United States, which will be released on Friday. The business results have decreased in intensity although, as of November 1, Apple's results are still pending. The pound has strengthened a lot in the last two sessions, precisely because the Bank of England is holding rates. However, there is much more optimism about the possibility of reaching a good exit agreement from the European Union on the 21st of this month. In addition, there have been comments that significant progress has been made for the financial sector since Brexit. The European and British negotiators agree on an alliance in the sector, which would include the exchange of data. According to the agreement, British entities would have access to European markets if their regulation is aligned, in its most important aspects, with that of the European Union. In recent months, dozens of banks and other financial institutions have undertaken to relocate part of their operations and staff out of London. So far, the alternative seems to be Paris. The European Commission is preparing the report on the Italian deficit and debt, which is needed to decide whether to open a procedure for the country following its failure to comply with the rules. To this end he asked Rome for information on the factors that could justify these deviations. Rome has until 13 November to send its reply. This is the same deadline for sending a revised draft budget for 2019, after the Commission rejected the one it had previously sent. The Bank of England's Monetary Policy Committee has decided to keep interest rates at 0.75%. The UK monetary authority raised rates to this level last August, after raising them by 25 basis points. At this meeting the Central Bank has also taken the decision to vote unanimously in favour of keeping corporate bond purchases at £10 billion and government purchases at £435 billion. The global economy continues to grow above forecast rates, supporting trade in the United Kingdom, they say in their statement. This is an important issue. A consistent rise in the euro would do a lot of damage to the weakened European stock markets. A first bearish factor for the euro is the political factor. There are multiple eurozone countries with political instability. The first is, without a doubt, Italy. With absurd budgets that will never be approved by Brussels. The Italian government knows perfectly well that it has nothing to do, although experts say they are playing the trick of lengthening the process to see what happens with the European elections. Another dangerous political factor is the weakness of Merkel's coalition, after the Chancellor acknowledged that she will not continue in politics. 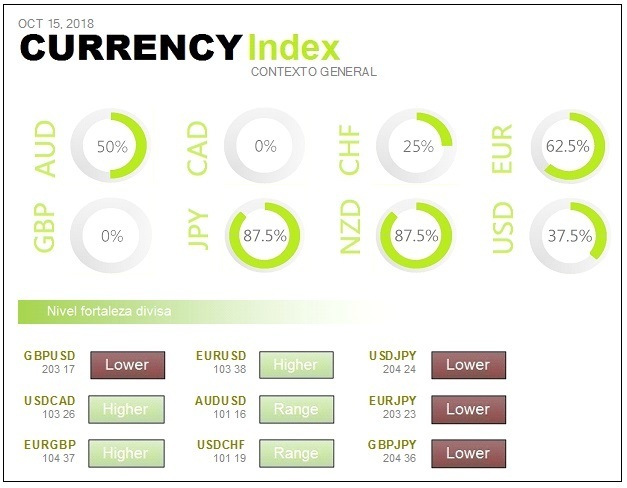 A final bearish factor for the euro is the factor of interest rate differentials, which are rising rapidly, and this is already a matter of pure mathematics.